Before you can send customer segments to Facebook, you’ll need to make sure your Facebook and Sailthru accounts are ready to communicate with each other. 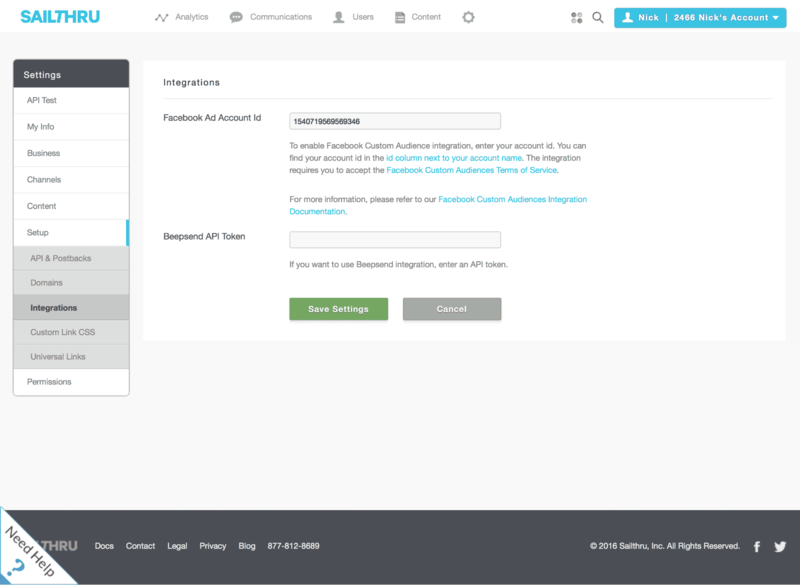 Each Sailthru user can connect their Sailthru account to a single Facebook Ad Account. 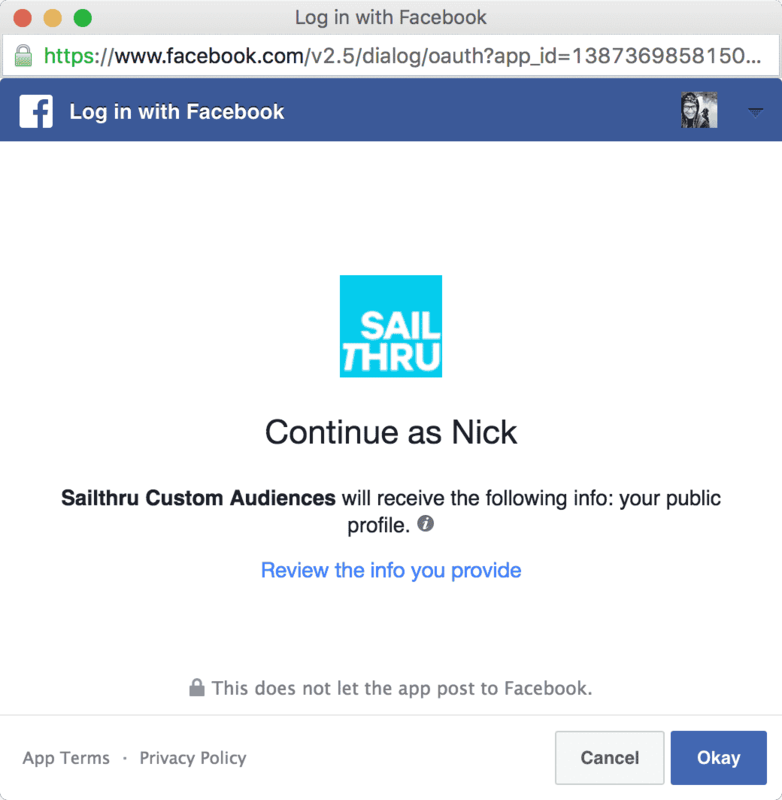 As a Facebook Business or Ad Account admin, complete the following steps to prepare one or more users to push Sailthru data to a specific Facebook Ad Account. A Facebook best practice is to use Facebook Business Manager to manage ad accounts. These instructions therefore offer steps that utilize the Business Manager tool. In Facebook Business Manager, click the top-left menu button and select Business Manager Settings. In the left-navigation menu, click the Ad Accounts icon and select the Ad Account name. Keep this screen open for the next two sections, below. To pass data between Sailthru and Facebook, the Facebook user must have the Admin or Advertiser permission in Facebook Business Manager to manage Facebook Ads for the specific ad account they will be using. In the Facebook Business Manager Ad Accounts section, with the ad account name selected, users and their permissions are listed in the Assigned People and Partners section. Confirm that the user is an Admin or Advertiser. Note: Facebook requires that users agree to the corporate Terms of Service for Custom Audiences. Each advertiser/admin may be prompted to do this the first time they create a Custom Audience. While you may have already agreed to similar terms on a personal Facebook account, this may need to be completed again under Business Manager. With the ad account opened in Business Manager Settings, copy the Ad account #. If you will be sending user data from your Sailthru account to this ad account, save this account number for use in the next section, “Sailthru User Configuration Steps.” If another Sailthru user will be linking their account to this Facebook Ads account, send them the ad account number with a request to complete the “Sailthru User Configuration Steps” below. In My Sailthru, go to the Settings page, and under Setup, select Integrations. Paste the Ad Account number into the Facebook Ad Account Id box. In your Sailthru account, go to the Lists page and look for a list with 20 or more users. It can be a smart list or natural list. You can also create a new list for this purpose if needed. Click the cloud icon on the right end of the list’s row and choose Facebook Custom Audiences. The first time you export a list, a popup window is triggered. 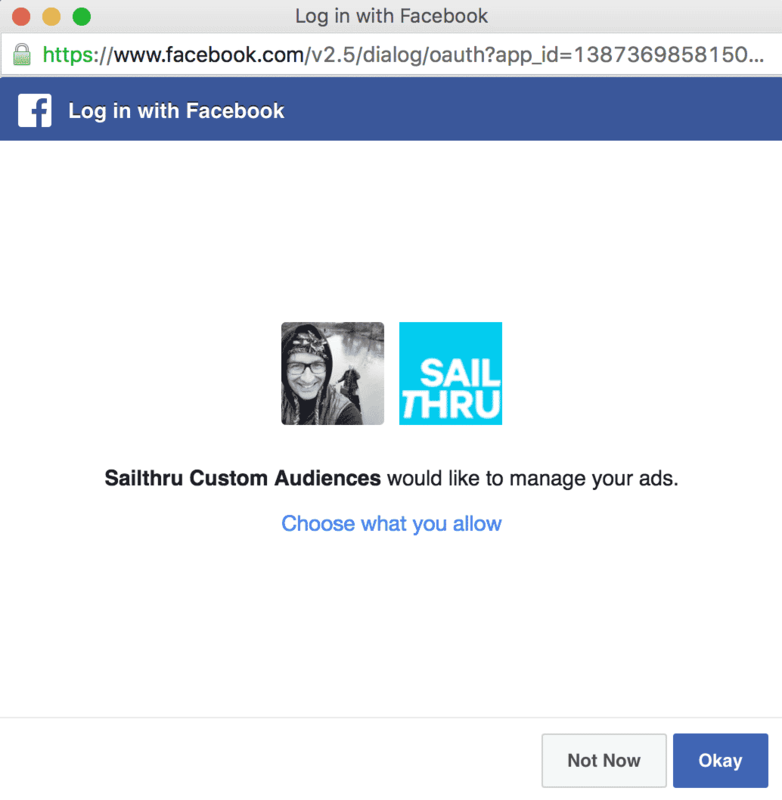 You are asked to give the Sailthru Custom Audiences app permissions to access your public profile and manage your ads. This step is required to be able to push user data into your account. Click Okay. You are then presented with a second screen, on which you will need to confirm access to manage ads in your Facebook account by clicking Okay. You’re all set. If there are no error messages, you have successfully connected your Facebook Ads account to Sailthru. If you do see an error message please confirm that you have entered the correct ad account ID in Sailthru and that you have advertiser or admin permissions on that ad account (per the section above, “Facebook Business or Ad Account Admin Steps”). If you need assistance, please reach out to support@sailthru.com who will be able to help.